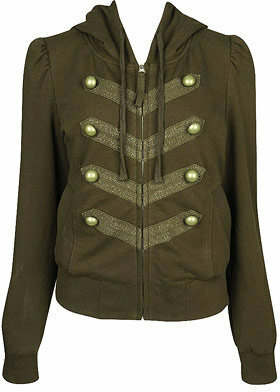 This Juicy Couture hoodie with military-inspired detailing sells for $178 at bloomingdales.com. Get the look for less with Forever 21's Bell Hop Zip Hoodie, just $24.80. Never thought I'd say this, but I prefer the Juicy version. It's subtler. They're pretty durned close, though - well spotted, as always! Haha. I love how F21 keeps a step ahead. To my mind it's the mixture of two styles - military and casual. Looks really splendid!